Thanks for holding me up while the dam broke during our first encounter! I might’ve looked as if I were drowning but with your support and holding a container for me to express what apparently needed to be felt, I not only have the courage to let that dam break but I am learning to swim and play in the river without the need to rebuild the dam! I delved into my deepest fears and experienced the deep and abiding resistance toward life I have carried for years not even realizing it. I have been stuck in this holding pattern of suffering and no one has ever referred to it as trauma. Thank you for seeing this and pointing it out to me. Sometimes just the awareness itself begins the healing process. After our session on Monday, I stayed with the “trouble” and gently inquired, embraced, allowed and accepted all of it and let it teach me. I feel I have grown so much in one week’s time. I have experienced so many insights and understand myself in a way I could not previously comprehend and had been wrestling with for most of my life. I was always hitting an impasse that blocked me from going deeper. In our session and the inner work I followed through with this week, the deadlock was exposed and the secrets revealed. I am in awe. I took a hacksaw and cut off the legs of the bed so the monsters and terror are now put to rest. I am learning some of the greatest lessons of my life through this experience and I know I have the resilience and fortitude to fully integrate what I am experiencing to live in freedom and flow with life. I am feeling so alive and refreshed and easily experience the fullness of every moment as I choose to be present! Truly the phrase “born again” comes to mind! I have so much gratitude, feel connected and so loved, like I am being held in the Grace of Being, beyond what words can describe. I do trust God and life and know the Universe is friendly from my experience this week. I am choosing to live and love with an open heart. Inquiry has become a way of being for me this week as I am so engaged and in a state of wonderment – so curious and in love and even more dedicated to Truth. Thanks for helping me find my way back to my Self and sharing your Presence with me. Thank you for holding the space and witnessing my “baptism”! At times this week the thoughts came to me that I may have not done the inquiry correctly or was hijacked by a deep trauma and went off the rails, wondering and worried about your view of it all, etc. But I trust that this was an opportunity orchestrated by Spirit for my soul. Although I am doing the best I can here, words cannot express the depth of healing I am experiencing. As for the doubt, I released (those were some of the more difficult moments but I did it!) all doubts by tuning into and reestablishing my trust in myself, life, All That Is. I actually used the doubt to inquire and found my trust! This really works- what a process and it’s so easy – when it’s not difficult! Haha! Life is so good! I don’t know how to even begin to thank you. This past year has been transformative for me and I owe a lot of that to you. Our sessions and the tools you have given me have opened up areas that have been blocked for a long time. Now I have more awareness of what is going on inside of me and how to explore that. I have deeper relationships, a more loving marriage and greater ease with life. I know I will continue this work in Uganda and throughout my life. Thank you so much for your love, patience, attention and devotion to your work! I am a wife and mother of two beautiful girls. I am fighting a rare cancer. Before I met Dale, I did not realize how much my emotional baggage had affected my health. I had so much anger and bitterness in my heart, and it was eating me alive. Holding on to anger and bitterness is like taking poison and then waiting for the other person to die! Dale is a miracle worker – my life will never be the same! In only five months, I transformed the anger in my life into peace! Through Dale’s Heartwork techniques and his meditation class, he helped me realize and achieve what I really, really wanted in life. I have never before felt so FREE and full of Peace, Love, Joy, Compassion, and Forgiveness! Thanks to Dale’s online Forgiveness Retreat, I was able to forgive the people who had hurt me in the past. I was shocked at how my physical symptoms cleared up. I had suffered chronic back pain for most of my adult life and now it’s gone! After I was diagnosed with cancer, I could not sleep more then 3-4 hours at a time. Now I can sleep for 8 hours straight! My cancer markers had reached the danger zone, a level of 2.5, back in August. The combined effects of alternative treatments and Heartwork surely both played significant roles in bringing my cancer markers down to 0.0! As I said before, Dale is a MIRACLE worker!! For anyone willing to get to the heart of their problems, to have an open mind, and to work towards living and having Peace, Dale is the perfect helper for you to achieve what you really want. He also does Skype sessions for those who live outside of the Rochester area. There isn’t enough money in the world to pay Dale for all he has done in my life. I hope this sparks a change in your life. “Live in the Present, so you won’t dwell in the Past or worry about the Future. Thanks to Dale and God, I have had many breakthroughs and now have an open heart full of Peace! Looking back to what my perspective of my life and my world was when I completed my application to attend the Heartwork retreat in early October 2010, I realize now that I had no idea whatsoever of the journey that I was about to start. I had heard about Dale Goldstein from a trusted physician who described his own experience of a Retreat facilitated by Dale as being “the most challenging, terrifying, and ultimately freeing experience of my life.” He warned me, “Dale goes beyond the intellectual … it is impossible to fully attend and stay ‘safe’ … he offers the opportunity to break through protective layers and thus become truly free.” I thought at the time I understood his words and the process I was about to enter; in retrospect, I realize I had no idea what he was talking about. If I had, I am not sure I would have had the confidence or courage to show up. The Heartwork retreat invited me to find out far more about myself than I ever knew … or ever wanted to know. I came to learn who I really am, how I had protected (and consequently limited) myself; how I had rationalized, avoided, filtered and distorted experiences and the people I had come into contact with and lived with. Dale’s initially innocuous sounding query – “What do you want? What do you really, really want?” — opened a door to a process that was at first puzzling, then terrifying, but ultimately liberating. This process of growth and learning has given me confidence to move on. I have learned that the terror that kept me prisoner will not kill me; that instead of running from the pain, I have to embrace it in order to go through it in order to get past it. My healing journey with Dale has brought magic and mystery to my life. Or have I merely now reached the point of “allowing the magic and mystery that has always been available to me”? I do not know which – I only know the transformation has happened and continues to happen. My relationship with the spirituality of nature has changed. How does Dale do what he does? By fully living unconditional acceptance. By creating profound safety. By being fully present. By trusting his client … which in turn encourages his client to trust him/herself. By bypassing the intellectual rationalizations and defenses and focusing instead on the emotional and spiritual. By letting his client take responsibility for what will happen or not happen. By being fearless … real … genuine. Last night I went to my father and together we did your forgiveness meditation. In a beautiful moment of peace, I forgave my father and he forgave me. We cried together and he smiled and said it was so beautiful. Those were his last words. This morning he passed away. As he left this earth I felt his spirit go and it was love. God bless you for your wisdom and love. Thank you for helping my father and I on our journey. It helped to put into perspective the difference between old egotistical Paul that believed a great warriors strengths were the muscle and size to intimidate, to make others fear by degradation or humility, and act like the pain of hurting others didn’t hurt me. 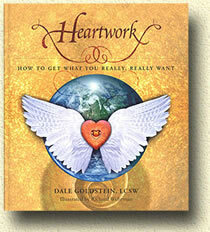 Dale, I am so grateful for you and the Heartwork way. Without you or it, I would have without doubt unconsciously crashed through this life wreaking havoc and believing there was something physical that would miraculously fill the emptiness. I have accepted and anticipate the beauty of slowly walking into the fire. To sit in torture knowing if I leave I will suffer 10 fold. Walls burn. Chains break. Mountains move. Wounds heal. Scars are reminders. Innocence is lost. Suffering is a beautiful blessing and God is always with me as he always has. I have grieved the loss of the “great warrior” who needed affirmation from the lost to tell him he was great. I have grieved the loss of the warrior who laughed at others, hated for reasons learned, and didn’t cry because pain can be buried. In this awakening into consciousness and spirituality my warrior spirit leads with love, awareness, compassion, and God’s hand on my shoulder. When I began this work with you, I was a very confused and indecisive individual. I was always looking for someone else to solve my problems. Problems I always thought were “caused” by someone else, whom I labeled as insensitive, uncaring, or screwed-up. I could never see my own responsibility in my interpersonal difficulties at work or in my personal life. I never saw that my confusion and inability to move ahead in my career and my marriage were caused by the invisible walls I had built around me. These issues had brought me to a literal dead-end. Beginning Heartwork was like walking into the warm ocean of LIFE. It was terrifying at first, but it was ALIVE, and my heart knew that. If I had any chance to really come to life, I had to face whatever fears, hidden memories, walled-off pieces of myself that came up; and come up they did! Through trusting my own heart, and through your skillful, perceptive, intuitive and loving guidance, and presence, I began to discover my own true self. It was never easy, but what challenge worth anything is? Today, I am now leading our firm as President, something I could never have foreseen even a few years ago. Alhough I struggle day by day to do the best I can, for my employees and myself, it is a struggle filled with joy and satisfaction. At home, Vicki has at last agreed to come with me to one of your workshops herself, having seen the positive changes in me through Heartwork. My employees and co-workers trust me, and have faith in my leadership. Some of my closest friends work there. Life presents continual challenges, pains and hardships, yet I now can place my feet firmly on the road of Joy, Strength, Purpose, and Presence, through your incredible gift to me of yourself and the Heartwork process.